Are you an agile architect? Why should you consider a versioning system for your UML projects? How UML 2.5 standard helps you to structure your complex software systems? Unified Language Modeling (UML) first appeared in the 1990s as an effort to select the best elements of the many modeling systems offered at the time, and combine them into a single consistent notation. It has since become the standard for modeling and design software, as well as for modeling other processes in the scientific and commercial worlds of industry. GenMyModel supports the latest UML 2.5 standard, as defined by the OMG (Object Management Group). It gives you access to many types of diagrams, on an online tool helping you communicate and share your models more effectively with Google Doc style collaboration. With GenMyModel, you can create UML elements using UML 2.5 standards, in an intuitive mode, directly in your web browser. 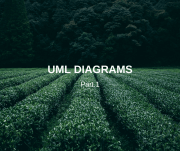 Day after day, we innovate to give you the best UML online modeler. Today, you can enjoy two new features: creating diagrams inside Elements and using attachments inside your projects.